Long Raw Handle Sword Pinstriping Brushes series 251 is a favorite of Sign Painters because of the long handle that's simular to a Lettering Brush. Pinstripers love the long reach the handle provides, which can help you reach some of the harder areas and deep pockets when pinstriping. The Long Raw Handle Sword Pinstriping Brushes series 251 has Black lacquered handles with graduated Brown Kazan Squirrel hair lengths from 1 5/8" to 2" held together with seamless nickel ferrules. Available in sizes 000, 00, 0 and 1. The only difference between 251 and 250 is that series 251 is Exactly the same as the Series 250, but made with a raw wood plain, non-lacquered handle. 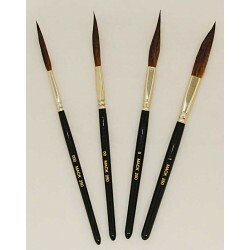 Individual Long Raw Handle Sword Pinstriping Brushes series 251 listed below.